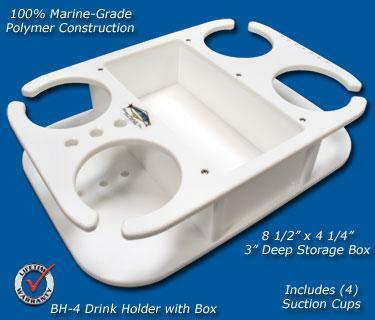 If you have the room the BH series drink holders are the answer to your needs. 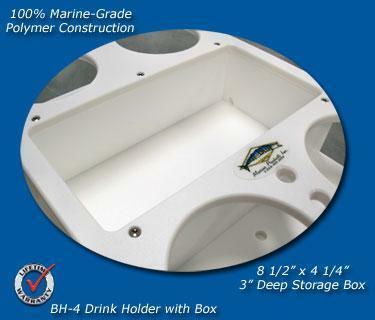 Designed for our customers due to the feed back we get requesting larger storage boxes and multiple places to store drinks. The box measures 8 1/2" x 4 1/4" x 3" deep and will fit everything from wallets to cell phones to cameras to sunscreen, etc. For your convenience we include 4 suction cups for the pre-drilled holes on the bottom. 4 cup holder and 2 cup holder versions. 100% marine-grade polymer construction means it's guaranteed for a lifetime. Overall dimensions; 9 3/4" x 14" x 3"